One of the most famous Italian food pairing is prosciutto and melon. 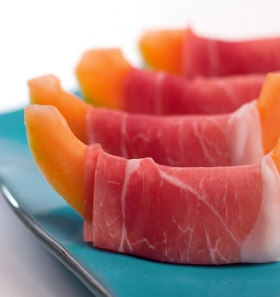 Prosciutto, pink sapid and dry, is the perfect wrap for the orange, sweet juicy cantaloupe. Serve the melon peeled and sliced in long crescents with one slice of prosciutto wrapped around each piece to be eaten with a knife and fork. Or wrap a small cube or ball of melon in a tiny sack of prosciutto for perfect finger food. The melon must be in season and as sweet as can be. Prosciutto is always available and it is a matter of taste whether the famous Prosciutto di Parma is selected or the saltier Tuscan variety from the Cinta Sinese pork is desired. As with all Italian ingredient pairings, no substitutes will do. Don’t wrap a slice of baked Virginia ham or of roasted prosciutto di Praga around a spear of watermelon or a piece of green honeydew melon. The taste will be wrong. The texture will be wrong and the color combination will not delight the Italian eye. Eating melons without the prosciutto is considered somewhat dangerous to Italians. 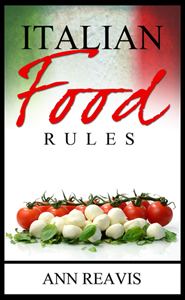 It comes down to an issue of digestion, as many things do in regard to the Italian Food Rules. If a “cold” food, like melon, is eaten without a “hot” balancing food, like a salty meat or spicy chili peppers, the body is “chilled”, which leads to the dreaded congestione, or at least, indigestion. There is historical proof for this claim. In July 1471, Pope Paul II died after a dinner consisting of three cantaloupes. The melons were to blame. In 1602, Giacomo della Porta, the architect for another pope, died after reportedly eating too much cantaloupe and watermelon, causing fatal indigestion when his organs became chilled. The lesson learned from centuries of Italian trial and error: Eat melon with prosciutto for a happy and healthy day.